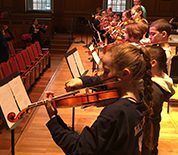 The Berkshire Symphony Family Concert with conductor Ronald Feldman offers plenty of family fun with the student community outreach effort, “Ephs Out Loud” in partnership with Kids 4 Harmony. This day of musical fun offers activities beginning at 1:00 p.m. that include a workshop with the Williams choirs, musical games and activities, and art by local elementary school students. Founded … Continue reading "Berkshire Symphony Family Concert"